Ninnes CE, Andersson S. 2014. Male receiver bias for red agonistic signalling in a yellow-signalling widowbird: a field experiment. Proceedings of the Royal Society, B 281: online. Abstract. Receiver biasmodels of signal evolution are typically regarded as alternatives or complements to ornament evolution due to coevolving mate choice, whereas sexually or socially selected agonistic signals are rarely studied with respect to receiver psychology. Against the background of convergent evolution of red agonistic signals from yellow ancestors in the genus Euplectes (widowbirds and bishops),we experimentally test the function of a yellow signal in the montane marsh widowbird (E. psammocromius), as well as a hypothesized receiver bias for redder (longer wavelength) hues. 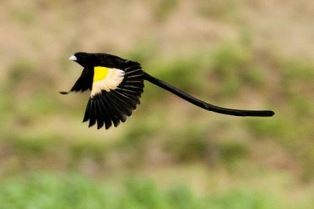 In a field experiment in southern Tanzania, males that had their yellow wing patches blackened lost their territories or lost territorial contests more often than controls or reddened males, which together with a longer wavelength hue in territory holders, indicates an agonistic signal function. Males painted a novel red hue, matching that of red-signalling congeners, retained their territories and won contests more often than controls. To our knowledge, this is the first demonstration of a receiver bias driving agonistic signal evolution. Although the sensory or cognitive origin of this bias is yet unknown, it strengthens our view that genetically constrained signal production (i.e. carotenoid metabolism), rather than differential selection, explains the carotenoid colour diversification in Euplectes. The study was undertaken from December 2011 to February 2012 on a population of Montane Marsh Widowbirds breeding in the Mtitu Valley, Southern Highlands, Tanzania. Males were captured on their territories using a spring trap with a model intruder in it. Read more about the Montane Marsh Widowbird.